1 What is in Makespace? 2 How does Makespace work? The space is great for individuals wanting to experiment, startups or companies wanting access to prototyping equipment, companies in the business who can come and do training and provide services beyond Makespace, and groups that want space to meet. Anyone who could benefit from a shared space focused on making things. At its core is a membership-based structure; the price of membership is £40/month inc VAT for full membership for 24/7 RFID access, or £33/month inc VAT for full student membership (no access outside of Cambridge university terms). Non-exhaustive list of people currently or previously involved. Members are encouraged, and non-members are welcome, to join our mailing list. You can read and post via the web interface or get messages delivered to your inbox. If you'd like to find out about upcoming real-world meetings, please join our Meetup group. Members: please contribute to this wiki! If you spot something incomplete or out of date, just hit 'edit' and change it. Various communication channels are listed here. Consider becoming an Owner or Trainer. Some information about other groups around the world that may be of interest can be found on the Links page. Some projects may need external Service Suppliers for things we can't do in-house. 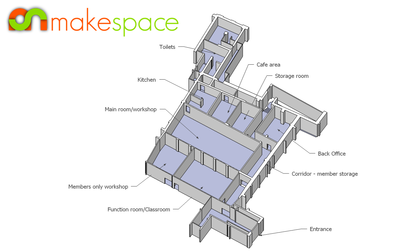 Makespace and its members host regular meetings, both to make things, learning things, and be sociable. For a list of these see meetup group. If you'd like to run an event, check out how to run an event in Makespace. There are write-ups of planning and member meetings at Meetings. We list some external events that may be of interest to Makespace members. We're grateful to the founding sponsors who helped set Makespace up. Most current running costs are met from membership payments but we gratefully receive any donations, however small, that can help with developing, running and improving Makespace for everyone. Contact management (at) makespace (dot) org. Thanks! This page was last modified on 22 June 2018, at 09:43. This page has been accessed 1,177,867 times.